I am a fan of life stories. I enjoy learning about people and experiencing the world through the eyes of another. I think memoirs and autobiographies are some of my favorite books as they offer so much insight and depth to the pages of the book. While I did not read Raindrops Glimpses Moments: An Unconventional Memoir of an Unplanned Journey by Len Richman, I looked forward to reading Shivers and Signposts. What was my review of Shivers and Signposts? I received a complimentary copy of this book for use in my review. All opinions are my own. I am also pleased to offer readers an opportunity to enter to win a copy of this book from the book tour giveaway shared at the end of this post. Quick Summary of Shivers & Signposts. 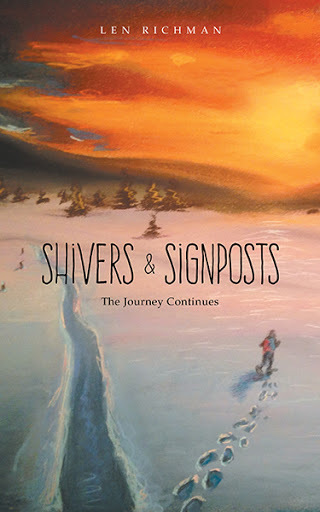 Shivers & Signposts: The Journey Continues is Len Richman’s second exploration of a life measured out by a distinct rhythm of his own devising. 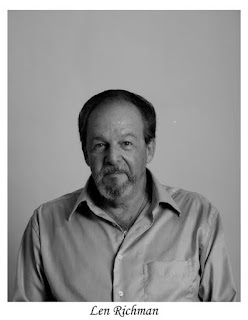 Picking up where his first memoir, Raindrops Glimpses Moments: An Unconventional Memoir of an Unplanned Journey, left off, Richman shows in Shivers & Signposts that he still has much to do, and much to say. Shivers at the thought of growing old, of becoming stale…occasional alienation and loneliness, Richman, is driven onward by “a pressing need to redefine and redirect his innermost self”, a self that he continually re-evaluates through the lens of modern technology, literature, theatre and film. -From the “Introduction” by Stuart Lubarsky, M.D. Richman's memoir offers more than his life story. Readers meander through the thoughts and emotions facing Richman as he transitioned through the stages of his life--and learn just how those thoughts and emotions guided him on his life journey. The book doesn't follow a set format or pattern--it just follows the life of Richman from his memories. He shares the good, the bad--and even the trivial--as even some of the "trivial" moments held value to the man he is today--and the one he will become in the future. Shivers & Signposts shares more than Richman's day to day life. Richman shares passages from books, quotes, and personal insights as he shares his story. The pages of Shivers & Signposts are well-written and flow well as the author presents his story. Would I recommend Shivers & Signposts by Len Richman? I was expecting a more "chronological" story than the one Richman presented--but, in the end, the reflective style of the book served to remind me that our present is composed (daily) of randomly, resurfacing pieces of our past! Memories. Reflections. Recollections. This book isn't action packed--although the author did live a fulfilling life. It's written as more of a reflection on where the author has been--and the path his life has led him toward as he looks forward to the rest of his life. If you enjoy reading a life story in which the author shares ups, down, successes--and vulnerabilities--this book is well-worth your time.